This contemporary loveseat from CorLiving celebrates style and comfort in a modern design. This finely upholstered sofa delivers reliability through the durably crafted wood frame. Generous foam and fiber batting cushion provides the ultimate in comfort. The contemporary metal legs gives the sofa grounded stability and the padded, slightly angled backrest makes it a treat to lean back and relax in style. The removable backrest allows this sofa to be more easily moved through door frames. This fabric loveseat is perfect for those looking to upgrade their living room. The wide armrests and chrome legs deliver a soft modern aesthetic that creates a welcoming environment you and your guests will love. Wide padded arms, supportive cushions, and upholstered in a soft touch chenille fabric, this loveseat is a product of thoughtful uncompromising design. Bring home the perfect loveseat and create the home you've always wanted. Create a welcoming home with this sculptural loveseat, featuring fluid lines and a soft touch chenille fabric, exuding a sense of warmth that invites you to sit and relax. The generously padded cushions and armrests create a cozy look, making this loveseat ideal for those who value design and comfort. This visually stunning loveseat is undeniably comfortable, making it easy to create an inspiring home. Unwind in this plush reclining loveseat. Feel the stress melt away as you sink into comfortable supportive cushions, upholstered in a soft touch chenille fabric. The sturdy wood and metal frame is engineered with a solid foundation ensuring the reclining mechanism works flawlessly for years. The Montego contemporary 2-seat loveseat in black microfibre adds fashionable style and function to any room in your home or office. Its wood frame and legs ensure that this item is a strong and durable piece of furniture for years to come. Each piece comes in one easy-to-manage box which is deliverable by courier. This item is easily assembled in minutes. 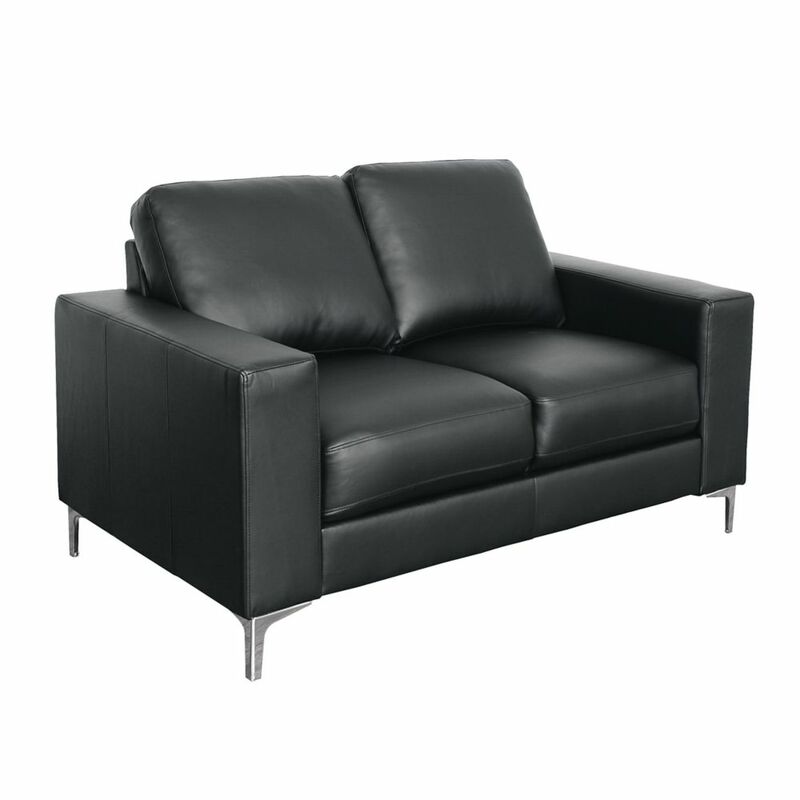 Cory Contemporary Black Bonded Leather Loveseat This contemporary loveseat from CorLiving celebrates style and comfort in a modern design. This finely upholstered sofa delivers reliability through the durably crafted wood frame. Generous foam and fiber batting cushion provides the ultimate in comfort. The contemporary metal legs gives the sofa grounded stability and the padded, slightly angled backrest makes it a treat to lean back and relax in style. The removable backrest allows this sofa to be more easily moved through door frames.